been uploading to our Etsy Shop today!! Mark your calendars and tag your friends! Spread the word! Extending Grace is celebrating our 2nd Anniversary and we’d love to have you join us! – Two Twisted Gypsies Charm Bracelet Buffet -You select your pieces and Michelle will create your custom bracelet while you shop! – Audra from Too Hot Mamas will be here with a smorgasbord of pepper products. And Saturday, the 7th, the savings and pop-ups will continue from 10 -4 pm. Join us Saturday June 16th 2018 for a Sip & Create with our friends Michelle and Brian Tice from Two Twisted Gypsies. 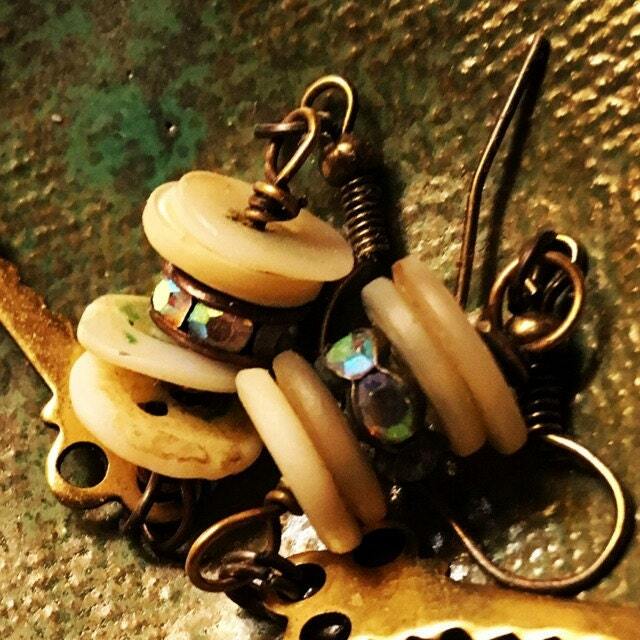 You will learn how to make a one of a kind assemblage necklace. You will begin with selecting a vintage spoon that Brian will have available stamped with a variety of phrases such as the ones pictured. (If you have a special phrase you want on yours, please contact us via facebook messenger after you register for the class). You will choose from a variety of adornments such as an vintage earring, brooch, scatter pin, shoe or dress clip, and then select charms both vintage and new or found objects to add to your design and transform it into one of a kind charming charm necklace. If you’ve been collecting or perhaps inherited from your mother or favorite aunt, a gorgeous vintage brooch or pair of earrings, this technique might be just what you’ve been waiting for, as now you can get those timeless pieces out of your jewelry box, and transformed into a new jewelry creation of your very own. I will demonstrate step-by-step techniques that I use in all of my jewelry designs as well as information working with basic findings such as closures, jump rings, head pins and more. Class is $40 all supplies are included. Seats are limited and will filling up quickly so don’t wait to get in on this fun afternoon with us! SIGN UP by visiting the Extending Grace Facebook Events page!! There are NO REFUNDS FOR WORKSHOPS! However, if you cancel with at least 48 hours notice your FULL reservation fee will be turned into a store credit that can ONLY be used for future workshops. Same day cancellations or no-shows will NOT get a credit for a future workshop! Refreshments provided and sipping included (for adults)!